If you see a dirty chair, would you sit on it without cleaning? Chair in both home and office requires periodically cleaning, maintenance and care, so the upholstery remains clean and sanitized. Also, by getting chairs professionally clean will increase the overall longevity of the product. 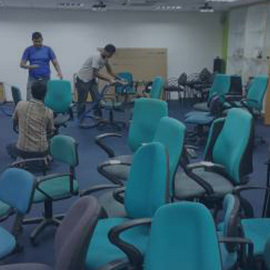 If you are looking for Chair Cleaning in Vadodara or Dining Chair Cleaning in Vadodara, then ECO Facilities Management offers professional services to maintain your upholstery. We know the best cleaning method and its shows in our service. Why do you need to trust ECO Facilities Management Chair Cleaning Services? When you use chairs on regular basis, dirt and stains get accumulated which overcast appearance the upholstery. Only a thorough vacuuming and shampooing will help to get rid of dirt and stains from the chairs. ECO Facilities Management Chair Cleaning Services have a professional team that will provide the best cleaning services in town so that the upholstery is left looking new and thoroughly sanitized. Our method of cleaning is done a systematic way. The maintenance staff is experienced and won’t cause the sofa cloth discoloration, shrinkage or color bleeding. With years of experience in cleaning different fabrics, color blends, and textures, we can clean almost all kind of chairs effectively. We don’t experiment but find one stop solution to clean dirt and grime from chairs. Our methods are effective and will lengthen the life of upholstery. Compared to changing the chair covers or buying new chair, our cleaning service is economical. ECO Facilities Management is a known name for Chair Cleaning in Vadodara and Dining Chair Cleaning in Vadodara. If you want to restore the beauty of upholstered furniture and chair, contact our team, and we will be there to renew old chairs with thorough professional cleaning.